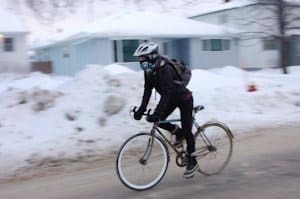 Prepare Your Bike : Riding cold salty pot-holed roads takes a huge toll on your bike. Salt etches away at frames, paint jobs and metal finishes, and grit and grime gets into bearings and friction surfaces accelerating wear and shifting mechanics out of adjustment. So if you have the choice don’t use your pride and joy. Rather, pick a bike you can adapt without worrying ruining its expensive good looks. More than ever, ensure your choice is well-maintained and tuned up. Nothing is as miserable as a preventable mechanical holding you up just as the street lights turn on and the sleet moves in. And of course, carry a small tool- and flat kit just in case. Tires : In the winter flints, glass and rough roads subject tires to the limit. If you’re riding regularly throughout the season consider running heavier duty and wider tires on your road bike. Most road bikes will take 25mm wide tires and many will run 28mm wide tires. Consider something like Continental 4-Seasons if you’re looking for toughness and performance. 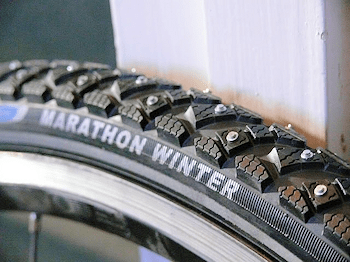 Continental GatorSkins provide great flat protection at a lower price and if you’re looking for the ultimate in winter protection look at the Schwalbe Marathons. If you’re regularly riding on ice and snow look at getting studded tires for greater control and security. Fenders : Nothing says winter riding like the black streak up your back which accumulates after almost any ride. Fenders or mudguards not only protect you from the spray which splatters up your bike, but also helps protect the rest of the bike from excessive exposure to the elements and dirt. Some bikes have fittings for fenders, but it’s possible to fit fenders to almost any regular road bike or hybrid. 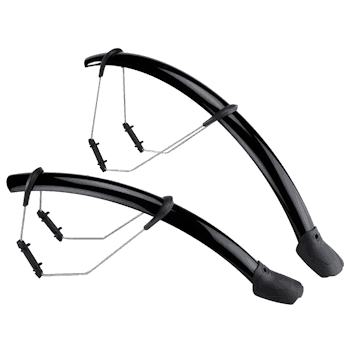 Clip-on types are also available if you want the option of removing the fenders on fine weather days. Stay Warm : Of course, you need to stay warm. 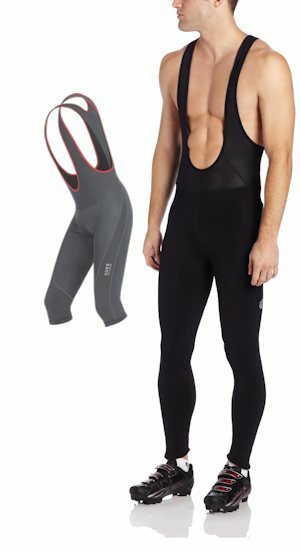 As well as wearing winter-specific jackets and tights look after your extremities. Winter cycling shoes are, of course, ideal, but start with Merino wool socks. Wool can carry its own weight in water before it even feels damp and provides better insulation than most synthetics. Insulated and water-proof shoe covers will help keep most feet warm. Use toe-covers if you’re looking for something you can stick in your back pocket as the day, hopefully, warms up. Also, check your shoes for cooling vents. Some have the ability to be shut. Otherwise seal them up with some duct-tape or similar. Lastly, resist the temptation to make your feet too snug. Leave enough room for circulation to help keep your feet warm. Hands, of course, also need protection from the cold and wet. Choose a full finger, insulated glove, preferably with a high-tech synthetic barrier such as WindStopper or similar. Some people find their hands fare better in a mitten or lobster-claw variation. I find silk glove liners really help. Heads are usually covered by a helmet, but features which make for a great summer helmet, like cooling vents, may prove too chilly for the winter. 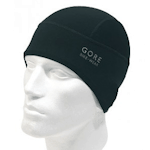 Look for a thin cap made from WindStopper or other synthetic which will help prevent heat loss through the top of your head and cover your ears. You might want to consider a face-mask or balaclava in really nasty conditions. Get Lit Up : Never has effective bike lighting been so good and so available. 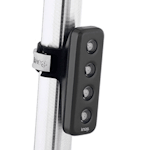 Virtually all lights now use very bright and efficient LEDs, and many are re-chargeable. Re-chargeable lights cost more, but most are capable of, at least, 600 charging cycles. When looking at a regular battery light remember to factor in the cost of 600 sets of DuraCells into the true cost. A bright rear light is absolutely essential with most having a selection of steady and pulsing modes. Rear lights output from about 10 lumens of red light up to about 50 lumens. Front lights fall into two types; conspicuity lights and headlights. Conspicuity lights feature a very bright, wide field beam which only minimally lights up the road, but ensures you will be seen – about 50 lumens to 100 lumens. Headlight focussed beam lights tend to be more expensive, but really light up the road or trail, depending on their power – from about 300 lumens to 2500 lumens. Around 700-1000 lumens will be plenty for most road riders and commuters. The more powerful lights are for off-road use, although the extra power can be useful on the road too. It’s that time of the year again when, if you don’t already have a bicycle helmet, you should be thinking of getting one. And even if you already have a helmet it might be time to think of getting a new one. All the gals and guys at Halter’s wear a helmet whenever riding a bike, no matter if on the road, on the trail, or just cruising around the neighborhood. In fact, most of our customers think that way too, although, in New Jersey it’s not the law that you must wear a helmet when cycling. However, it is the law in NJ that children must wear an appropriate helmet even if they’re just a passenger on a bicycle. There is an argument that there is no need to wear a helmet, and indeed it is a personal choice. It’s true that in more cycle friendly cultures very few people, even children, wear helmets and the accident/injury rate is lower than in most helmet wearing societies. Unfortunately, this happy situation does not apply in the US, and on balance we strongly recommend every cyclist wears a helmet. Helmets really do have a limited life in use. Any helmet that has already taken a hit in a crash should immediately be replaced. Helmets that have been subject to sunshine, UV, sweat and extreme temperatures should be replaced every two or three years. If the adjustment pads are rotten or missing, you can replace them, but their condition is a good indicator of the state of the rest of the helmet. Helmets are not just a chunk of poly-foam, but at the very least have an interior structure and reinforcements which can degrade over a period of time or can be disrupted and made less effective once it’s taken a hit and done its job. Halter’s wrench, Tripp, recently took a fall as his helmet shows here. His GPS showed an instant 21mph to zero and, typically for a mtb incident, the helmet protected Tripp from a strike to the back of his head. Helmets designed for MTB use tend to give more protection to the back of the head for this reason. They also usually include a peak which provides some eye protection in the woods. Road helmets tend to give more protection to the temples and don’t have a peak to make looking forward when on the drops easier, but riders who wear glasses may find a peak a benefit. Regardless, most riders wear whichever helmet is most comfortable and suits their needs whether they’re on the road or the trail, or just around the neighborhood for that matter. 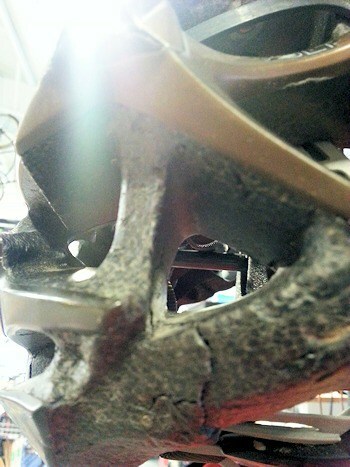 All helmets on sale at a quality independent bike store will usually comply to at least two out of three of the principal international standards whether they cost $40 or $400. US, European and Australian certifications and requirements are slightly different, but in practice any helmet which meets any one of them promises the best protection available regardless of cost. More expensive helmets will be sized for a better fit, be lighter, enable better air-flow, be available in more colors, and have many detail enhancements, which may or may not be important to you. 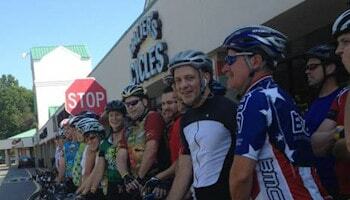 Halter’s sell helmets by Bell, Cannondale, Giro and Lazer. Be sure you start the season with a safe helmet. 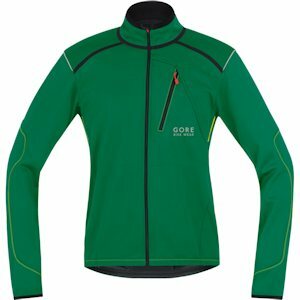 So you have to buy a present for your cycling friend, colleague or relation … and we know how picky cyclists can be don’t we? So here are a few ideas of items that are (almost) always useful to (almost) any cyclist. A rear light is always useful as well as being a welcome safety item. Useful, even on a summer day, as you cruise along under the shade of the trees. Basic battery rear lights from $10.00; rechargeable lights from about $30.00. We also stock a full range of front lights from $15.00-$500.00. Lighting sets from around $30.00. 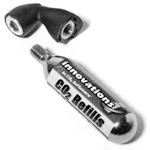 Always useful on the road or on the trail, a CO2 inflator – from $18.00 – saves time and means carrying less weight. 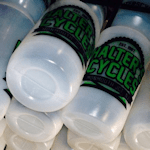 Halter’s also stocks a range of regular bike pumps – from $15.00 – and floor pumps from around $30.00. 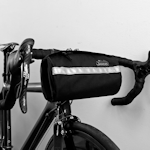 More than useful for an extended day ride, the Jandd bar bag has no ugly bracket to ruin the lines of a favorite road bike, but has plenty of room for the stuff riders need on those Century and charity rides – $18.99. 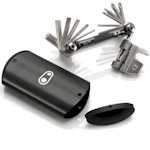 Look out too, for seat bags just large enough to take a spare tube, levers and bike tool – about $25.00 and up. Full featured bar bags from $50.00. Virtually all bicycle water-bottles fit all bicycle bottle-cages. Okay, so there are one or two exceptions … but only one or two. Every water-bottle, in the end becomes a bio-hazard, so new ones are always welcome. A basic bottle costs from around $5.00 and insulated ones $14.00. 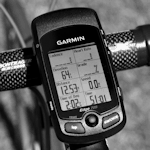 A bike computer is a great way of keeping track of speed, distance and time. A good basic wired computer from Cateye is from about $30.00; wireless from around $50.00. Serious users might be interested in a GPS featured unit. Prices for GPS start around $140.00; ANT+ capable $250.00 and full featured on screen mapping from around $400.00. 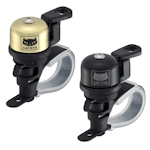 Nothing says, “Get out the way!”, quite as nicely and politely as a bicycle bell. Always useful if you’re riding in the proximity of pedestrians, in town or on the trail. On the bike, or off, we have the Hat. 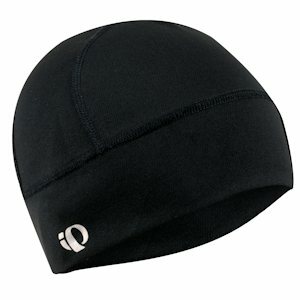 Under-helmet thermal skull-caps with wind-proof panels are great for on the bike and woolly beanies for the aprés-ride, and we have a hat for everything in between. And you can’t buy the wrong size. Bicycle multi-tools are always useful. A good basic, get-you-home, tool costs from less than $20.00. One with enough adapters to enable a full overhaul on a round the world trip will cost a lot more. Unique! Available nowhere else! 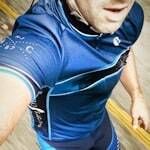 The Halter’s cycle jersey. 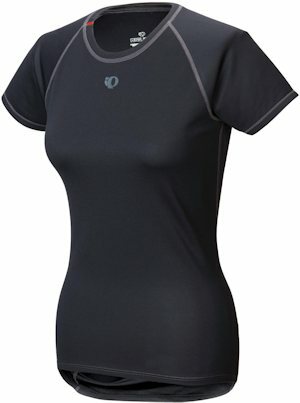 Made by Pearl Izumi and available in blue or grey, women’s and men’s fit. A reminder of their favorite store when they’re not in it – $110.00. And last, but certainly not least, the Halter’s Gift Certificate to any value you like … what more could anyone want?